Compare prices on car hire in Sydney from all the major brands and find the best deals. When you book through us, unlimited mileage and insurance are always included in the price given. Sydney is the largest city in Australia – and also the oldest (founded in 1788). It is also the capital of the state of New South Wales. The city is, both because of the size (over 4 million inhabitants) and because of the diversity of supply, a powerful tourist magnet. 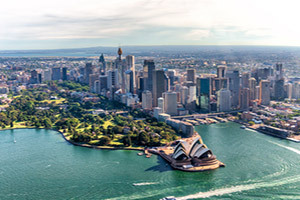 As many as 70% of all tourists to Australia visit Sydney. The city has, of course, everything you would expect in a metropolis of this size. When it comes to special individual attractions, however, takes the Opera House a unique position. With its sail-shaped architecture, and its central location in the port area, the building – designed by Danish architect Jørn Utzon – one of the 20 century’s most famous buildings. Opera House in Sydney is indeed a UNESCO World Heritage List.Other popular sites are the bridge Sydney Harbour Bridge, the 305 meter Sydney Tower and the impressive park Sydney Botanic Gardens. Sydney’s “skyline” is otherwise dominated by modern skyscrapers. Sydney is also known for its many exceptionally beautiful beaches. The most famous of them is Bondi Beach – where many movies, TV shows and music videos are recorded. Australia’s largest airport – Kingsford Smith International Airport – located 9 miles south of downtown Sydney. Sydney is one of our most popular destinations for car hire. Our unique search engine provides a wide range of rental cars at cheap prices as the prices obtained from multiple companies.